Granada Hills, CA September 30, 2017 — Annnd…Action! Photo Booth is pleased to announce its second appearance at the 15th Annual Rubber Ducky Festival coming back to Bridgeport Park in Valencia, California. The 15th Annual event will take place on October 14, 2017, from 11am to 2pm. A fundraiser for the Samuel Dixon Family Health Centers; Inc., this year’s event will have plenty of activities, entertainment and fun for visitors of all ages. Annnd… Action! Photo Booth is inviting the 500+ expected attendees to join them for a photo session inside the booth. Guests can take their turn getting “quacky” while posing for photos with lots of silly rubber ducky props and accessories or with Dorothy the Duck, herself! 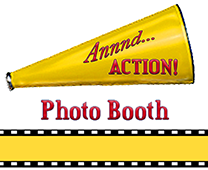 Attendees will get a free souvenir printout of their photo session and have access to their photos posted on the Annnd… Action! Photo Booth online photo gallery following the event. Duck Races start at 11:45am with flocks of ducks competing along a fast paced water course. In addition to the main event, fun family activities on-site will include food trucks with lots of tasty selections, a climbing wall; performers throughout the day, face painting, balloon artists, sports clinics, art classes; the Los Angeles County Fire Department Shakey Quakey Earthquake House, and much more. The festival is free to all attendees; however participation in the Duck Race is by donation. Those who “Adopt a Duck” on race day or before at www.duckrace.com/scv, will score a chance to win one of several cash prizes, including the grand prize of $2500 for the fastest duck down the waterway. All proceeds from the race event go toward patient care services at SDFHC. For more information about becoming a sponsor, adoption fundraising, performing, volunteering, or getting involved in the 15th Annual Rubber Ducky Festival event, contact Mary Hulbert at Mary@sdfhc.org or 661-257-2339, ext. 311. Established in 2016, Annnd… Action! Photo Booth is a privately-owned small business located in the Los Angeles area. The Company provides a manned photo booth for any occasion, indoors or out; and combines a sleek, modern looking camera set-up with an old school photo session environment. Using the latest DSLR technology and software, photos are quality and clear; printed on thermal dynamic acid-free paper for long lasting images that won’t fade over time. Clients choose from a variety of backdrops, texture and color choices. Touch screens and postcard or filmstrip printouts are always personalized to match the event. No two are exactly alike. The Company offers its exceptional service at reasonable rates and is able to accommodate events within a 30-mile radius of greater Los Angeles. To learn more about Annnd… Action! Photo Booth or to hire them for your next event, contact Victoria Genin at (818) 900-5480 or annndactionphoto@gmail.com or visit www.annndactionphoto.com. About Samuel Dixon Family Health Centers, Inc.
SDFHC was established in 1980 and named for long-time Val Verde resident and minister, the late Reverend Samuel Dixon. As the only non-profit health center founded and based in the Santa Clarita Valley, SDFHC serves the greater Santa Clarita Valley and is governed by a local board of directors, all of whom are Santa Clarita residents. The mission of SDFHC is to enhance wellness by providing quality primary health care services, which include dental services and mental health counseling, to un-served and underserved residents, with a special emphasis on serving the uninsured. Easily accessible services are available for the entire family in both English and Spanish. SDFHC accepts a variety of health plans and participates in a variety of programs that include Medi-Cal, Medi-Care, CHDP, EWC, FamPACT and My Health LA. A sliding fee scale is offered, keeping health care affordable for all. SDFHC is supported by countless individuals as well as corporate sponsors who help make affordable health care possible. Tax-deductible contributions are welcome. Health services are available at the Val Verde Health Center (661-257-4008), the Canyon Country Health Center (661-424-1220), and the Newhall Health Center (661-291-1777). http://www.sdfhc.org. Awesome! It was great last year and we hope our ducks win this year. The kids love it. Previous Attn: Pet Lovers in LA! Super Adoption Weekend is here.